One of our clients in the oral care industry invested in content marketing because it understood that consumers look for dental information online. The strategy was effectively driving traffic: Analytics reports showed 98 percent of content readers were LANDING on the news, navigating directly to the articles from Google search and referrals. However, the client wanted to go beyond traffic metrics and find out how the content was driving hard value. The company needed to see that visitors were not just coming to the ecommerce site, but were ultimately converting and purchasing products. The number of monthly landing page visits to Brafton content divided by the client’s monthly content marketing service spend gives us the cost per session. The number of landing page visits to Brafton content divided by the revenue generated by Brafton content conversions to get the per session value. Because this client runs an ecommerce site, it’s fairly straightforward to determine the revenue generated from news content readers’ conversions. Less clear? Check out our video to learn how to tie other web actions to dollar values. When all of this data was combined, we saw that the cost of each content reader steadily drops, while the overall value consistently increases. The company was clearly making money on its content production – and the rate at which the cost per acquisition dropped was satisfying. The company’s quarterly return on content investment grew 50 percent within a year. The company’s quarterly return on content investment grew 50 percent within a year. For some additional context, we compared the cost of content to the cost of the company’s CPC campaign. The cost of each content session is lower (and is decreasing) over time, while the CPC leads are more expensive and have slightly increased. One isn’t necessarily better the other – we find the two work well in tandem and support goals across the sales funnel. But what’s clear is that content marketing is a cost-effective solution for brands. Marketers and decision makers depend on hard numbers to justify investments and refine their campaigns. We helped this client understand how the benefits of web content go beyond organic traffic to generate consumer interest in products and drive sales. 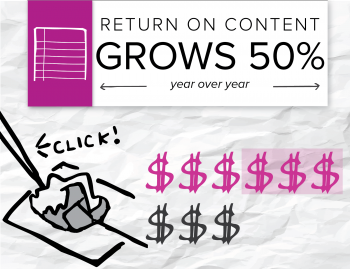 More importantly for marketers with a tight budget – we demonstrated how content ROI improves over time to bring greater value to the business.